This entry was posted in News, Video Games and tagged Amplitude, Guitar Hero, Harmonix, PlayStation, PlayStation 3, PlayStation 4, PS3, PS4, Rock Band, Rock Band Blitz, Sony, Trailers. Bookmark the permalink. I’ll hopefully be playing this at a gaming event next week. Reminds me somewhat of Wipeout, and that’s more than ok by me. 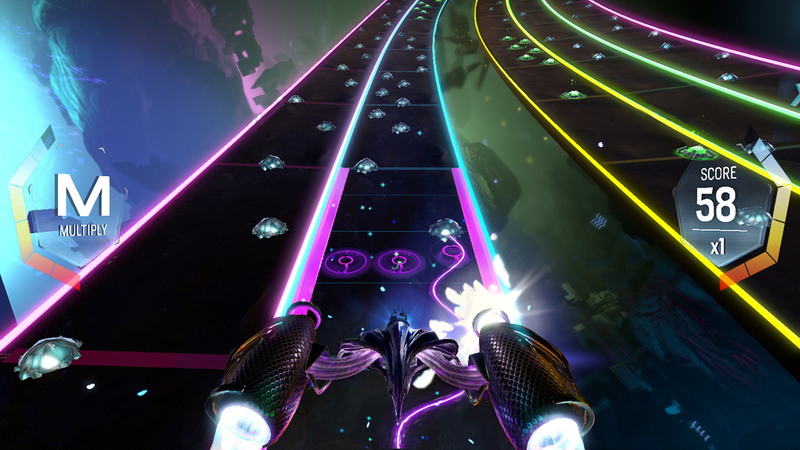 I know Harmonix is showing it off at PAX East, which makes it the best place to debut it to the public for the MA based company. I think another logical place for it to pop up will be SXSW. I can see where the visual intensity draws comparison to Wipeout. That frenetic speed is so integral to both games, complete with bleeding eyes and sore thumbs. Well, just as long as I don’t have sore eyes and bleeding thumbs!